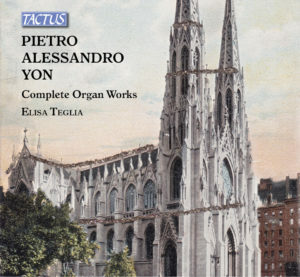 Elisa Teglia recorded for the Tactus edition the complete organ works of Pietro Alessandro Yon (1886-1943), an italian/american musician, organist of the St. Patrick Cathedral in New York. Yon wrote a large number of organ works, with a particular taste for virtuosity and musicality. 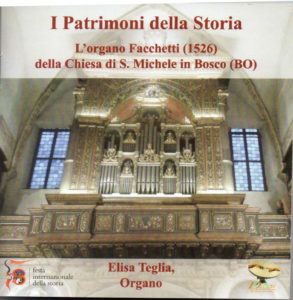 In the 4 CD of this publication, distributed from July 2018, there is also a booklet with the biography of the author and the analysis of his organ works. 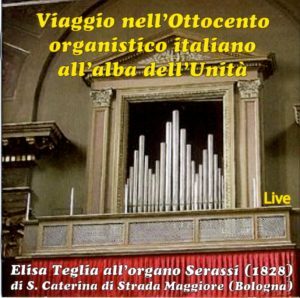 CD live products from Dipast (Centro Internazionale di Didattica della Storia e del Patrimonio) of the University of Bologna, recorded on the magnificent organ Serassi (1828) in the S. Caterina di Strada Maggiore (Bologna) Church, October 2011. 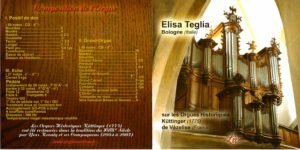 CD/DVD of italian musics from XVI to XIX century, recorded on the famous Küttinger organ (1775) in Vézelise (F). CD live “Pagine organistiche in concerto” edited by Videoradio (Milano/Alessandria) with pieces of the french, italian and german romanticism.